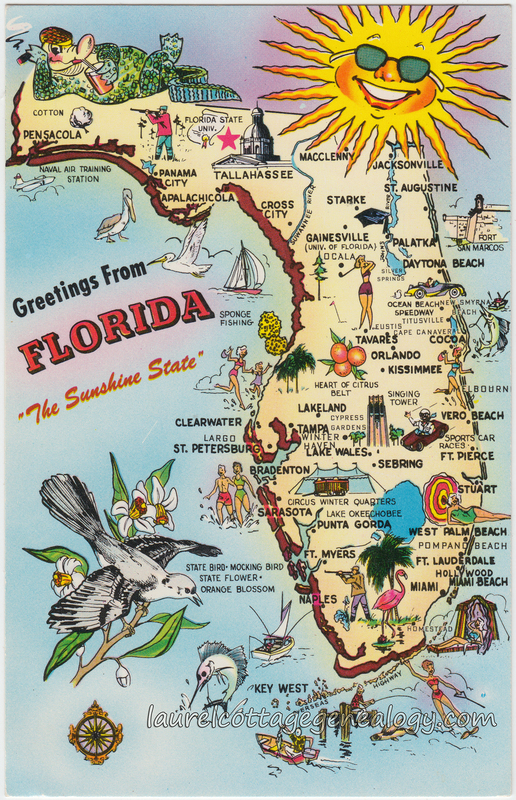 A vintage postcard, maybe from the 1960s. 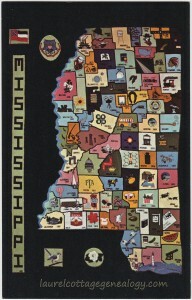 According to the back caption, the original map was done in needlepoint. 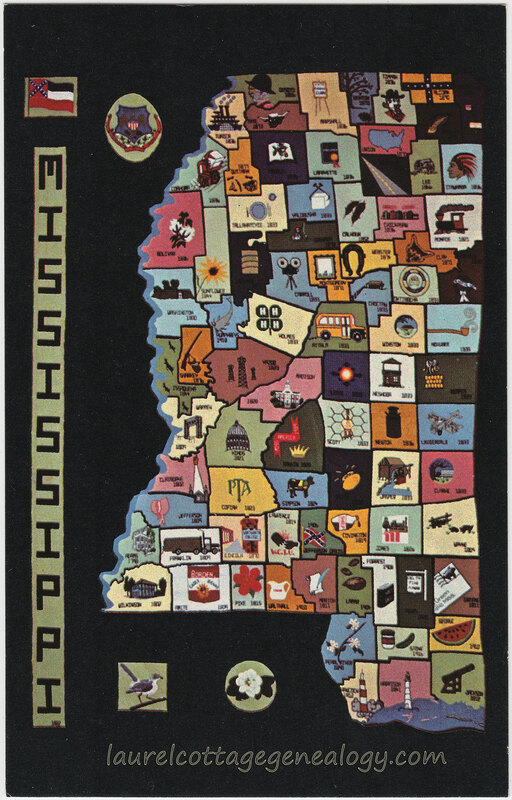 And it shows the map broken down by county, with a different design in each, and the Mississippi River, of course on the western border. 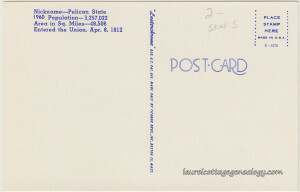 Divided back, unused postcard. Publisher: Marketing Professionals, Inc., P. O. 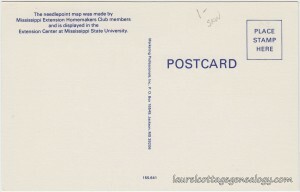 Box 16549, Jackson, MS 39206. Series or number 155,641. Circa 1960s. 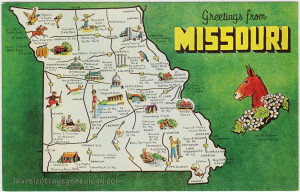 Missouri “Show Me State” Capital: Jefferson City. Area: 69,674 sq. mi. Population: 3,954,653. Motto: Salus Populi Suprema Lex Estro. The Welfare of the People Shall Be the Supreme Law. Flower: Hawthorne. Bird: Blue Bird. Tree: Dogwood. 24th State admitted to the Union. That’s a mule proudly representing the state from his garland of hawthorn flowers. The Missouri mule was designated as the state animal in 1995. Mules were introduced in the 1820s in Missouri, popular with farmers because of their hardy nature, pulled covered wagons of pioneers moving west, and played an important role in transporting WWI and WWII troops and supplies. 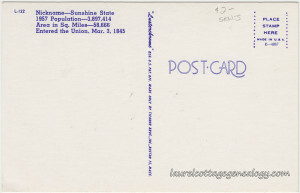 Per a Wiki entry the population listed here was recorded for the year 1950, so this postcard is likely from the early 1950s. 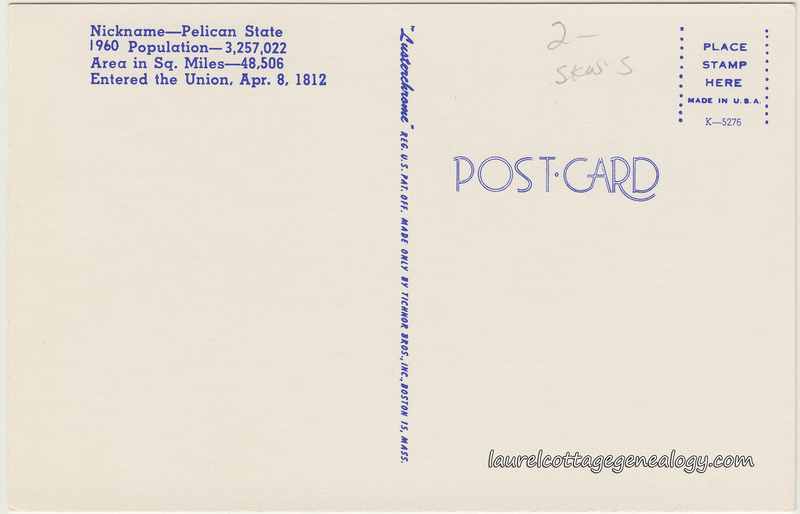 Divided back, unused postcard. 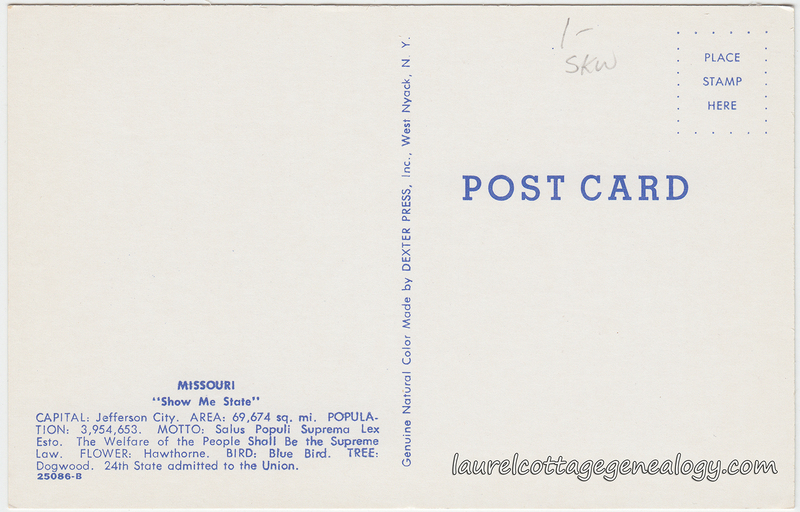 Publisher info: Genuine Natural Color Made by Dexter Press, Inc., West Nyack, N. Y. 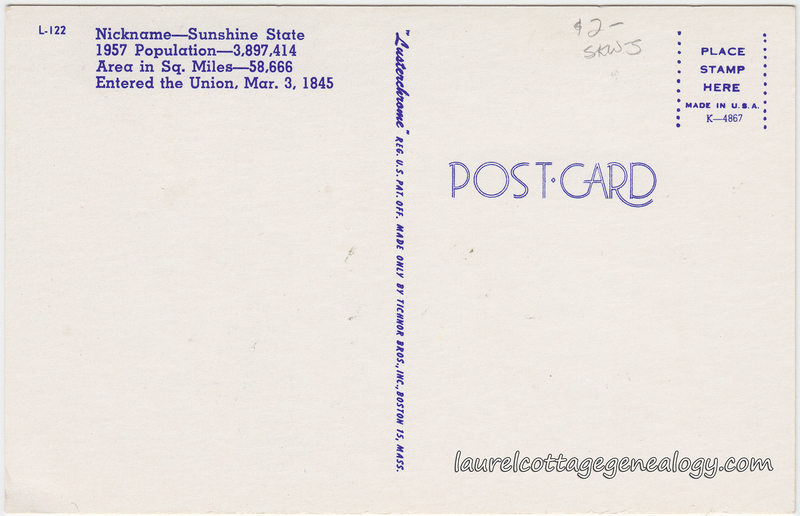 Series or number 25086-B. Circa early 1950s. 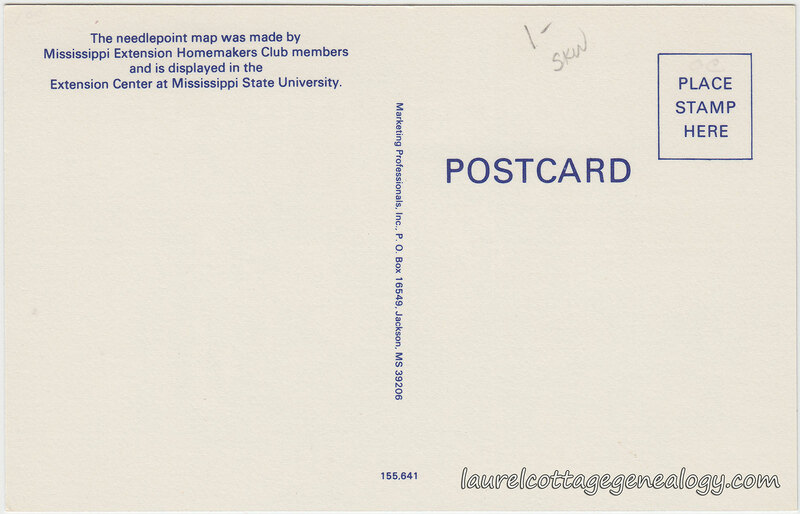 Here’s a beauty of a state map postcard. Love that gator! Divided back, unused. “Lusterchrome” Reg. U.S. Pat. Office. 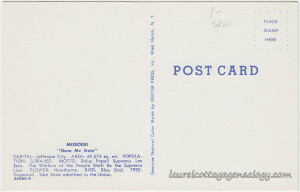 Publisher: Tichnor Brothers, Inc. Boston 15, Mass. Series or number L-122. Circa 1957. 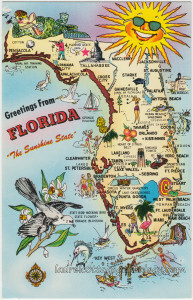 Very pretty state map vintage postcard. Wonderful colors. For being on such a small scale, the faces and poses are so full of expression. Look at the fish (!) 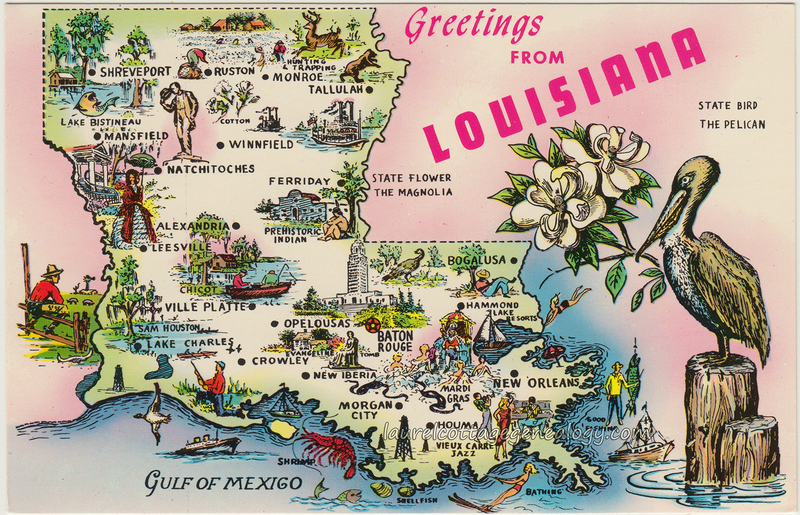 And though it’s not mentioned on the back of the postcard with the other facts, the pelican is holding the state flower – the magnolia. 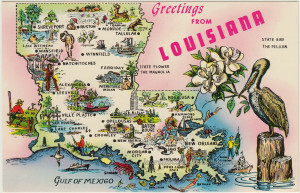 Divided back, unused, State Map View postcard of Louisiana. Circa 1960. “Lusterchrome” Reg. U. S. Patent Office. Publisher: Tichnor Bros., Inc., Boston 15, Mass. No. K -5276.